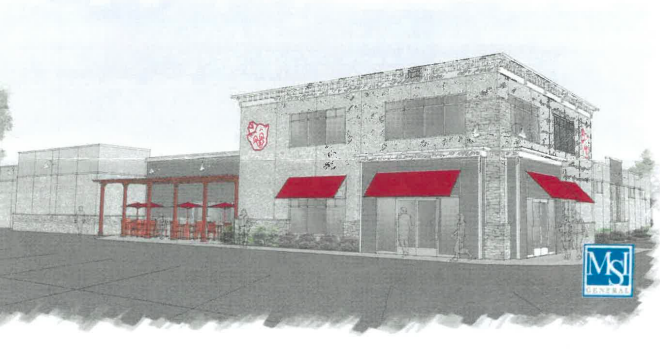 A rendering of the planned Piggly Wiggly expansion at its existing location. Next spring, Sister Bay residents will lose one of their favorite pastimes – complaining about the cramped confines of the village’s primary grocery store, the Piggly Wiggly. The longtime anchor of the Country Walk Shops has targeted Oct. 22 as the date to break ground on a remodel that will add almost 10,000 square feet of shopping, storage and office space to the store. For years residents have dreaded the thought of navigating the store’s narrow aisles and cramped checkout lanes in the peak of summer, something owner Tom Nesbitt took into account in the remodeling plans. The new store will be 71 percent larger than the existing store, taking it from 13,072 square feet to 22,772 square feet. Almost 6,100 square feet will be added on the east side of the building, and 3,600 on the west side. Shopping lanes will be enlarged from 5’6” to 7 feet, and the notoriously constrained produce section will be expanded, as will the bakery, deli, frozen foods and meat case. Beer lovers will see the beer cave double in size, and the liquor and wine section will be three times as large. From the exterior the most noticeable changes will be a revamped facade, a small square of cafe seating outside, and an enlarged two-story entryway for carts and specials downstairs, and offices upstairs. The store has pursued expansion plans several times during the last decade, including last September, but this time it appears construction will move forward. To expand Nesbitt had to negotiate a new agreement with the Country Walk Owner’s Association to meet village parking requirements. Lynn Church, co-owner of Tea Thyme and president of the association, said the association is excited for the expansion. For the shopping complex it’s more good news for a complex that was in flux for several years. The complex welcomed seven new businesses in 2018, Church said. That comes on the heels of new arrivals Twisted Tree, Discourse, and Tapuat Kombucha in recent years. The addition will impact staff as much as consumers, Nesbitt said. The store had long ago outgrown its space. Semitrailers are parked in back for extra storage in peak season, and staff work in the same cramped spaces as shoppers. MSI General Corporation will manage construction, keeping the store open throughout the project. Nesbitt hopes to get final approval on facade and utility details from the Sister Bay Plan Commission Sept. 25, with a completion target of May 2019. “When this project is completed, it will be difficult to remember what the old store looked like,” Nesbitt said. Nobody will be sad about that.